Thiti Thongbenjamas, Chief Operating Officer – Crossroads at Singha Estate, overseeing Maldives’ largest integrated tourist destination. The project size is approximately 680MUSD which consists of nine reclaimed islands inclusive of more than 1,200 resort keys, yacht marina, retails, and entertainment facilities. Singha Estate is one of the top 10 largest real estate development company and one of the fastest growing company in Thailand. After graduating from U.C. Berkeley in Architecture and Urban Planning, he continued to executive MBA program in Finance and Marketing. Thiti has over 20 years of experience within the hospitality and mixed-use business with profound international background having been based in Thailand, Vietnam, and United States. He has spent 11 years with Movenpick Hotels & Resorts with his latest position as head of finance for Asia Pacific and China; there, he played a vital role in launching and introducing the brand into Asia. 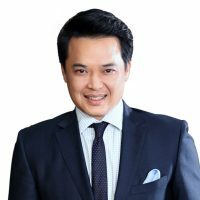 Prior to joining Movenpick Hotels & Resorts, he has spent 9 years at Intercontinental Hotels Group (IHG) where he held various senior finance and operational roles in Thailand and United States.